For the past few months I've been working on a literary side-project: Harvard Classics 365, through which I'm producing eBooks and a daily updated blog of classic literature for daily reading throughout 2014. I realise that Blogger Buster readers may find posts about literature a little "off topic". To appeal to all +Blogger users, I've created a free template for everyone to enjoy, and would appreciate any support from those who are interested to help launch my literary project on Kickstarter. Simple enough to use "straight out of the box"! Please take a look at the Bookish Blogger Template demo site to see the design in action. This template is completely free for you to download, share and use for any purpose. Providing a link back to this page is not required, though of course I would truly appreciate it! You can download the template as a Zip file here, which includes the XML template and full instructions for installation. As I mentioned earlier, I'm currently working on the Harvard Classics 365 project and have created a Kickstarter campaign to help launch the eBooks and website for 2014. 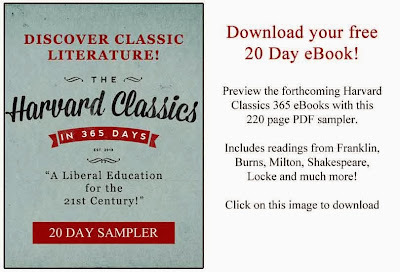 The project aims to promote "A Liberal Education in a Year" by collecting all of the literature suggested by Eliot's "15 minutes a day" reading guide for the original 52 volume Harvard Classics anthology. By pledging as little as £1, you will receive an advance copy of the eBook and help support a year of classic literature for everyone to enjoy. I hope to raise just £250 to secure the launch of the eBooks and website for everyone to use in 2014, and would truly appreciate any support offered by Blogger Buster readers to help make this project happen. I understand this post is a little different my usual Blogger tutorials and content, but can assure you that normal service will resume shortly! If you have any suggestions for future tutorials, resources or templates you would like me to write for Blogger Buster, please feel free to let me know in the comments section below or via the +Blogger Buster page. In the meantime, I hope you will enjoy using the Bookish Blogger template, and welcome any support for my literary project.